Three hundred people braved rain and wind to fish the fifteenth Annual Sand Crab Classic Perch Tournament along the beaches, piers and rocks from Big Sur to Half Moon Bay on March 9. The event was a benefit for the Monterey Bay Salmon and Trout Project, whose mission is to recover the native salmon and steelhead populations of the Monterey Bay region. The event raised $5,000 for the project, established in 1976. If it wasn’t for this project, anglers would not enjoy the solid fishing that they found in the San Lorenzo River and local creeks this season. Over 350 people attended the weigh in at the Portuguese Hall in Santa Cruz – and 40 volunteers helped out with the event. The event is one of my favorite events of the year to go to. The 300 places for the tournament were sold out in only two days this year. This year there were more people than I’ve ever seen at the event. This year the winning fish were caught from shore from Big Sur in the south all of the way to San Gregorio in San Mateo County. However, most fish were landed inside Monterey Bay. 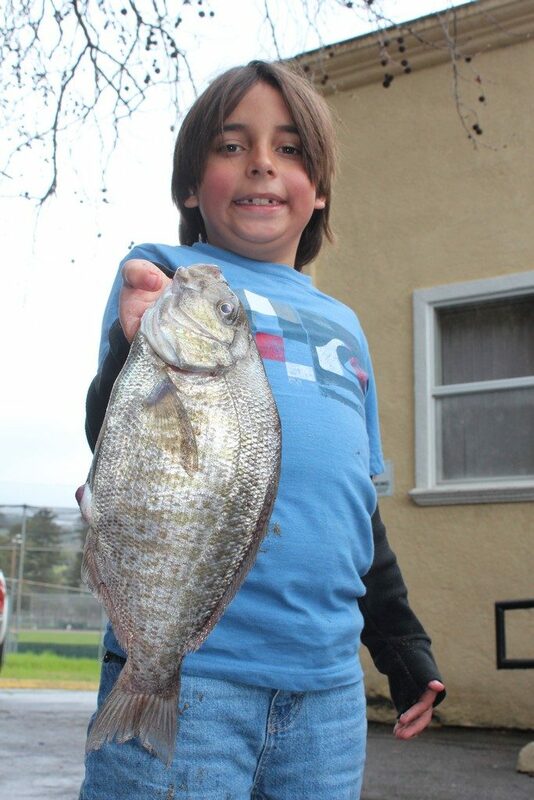 Some of the spots were anglers caught perch included Santa Cruz, Monterey, Manresa Beach, New Brighton Beach and Zuma. Other spots outside of the bay included Carmel and Pescadero. As usual, the popular barred perch dominated the catches, but striped, pile, calico and redtail perch also earned anglers trophies. It is notable that the Monterey Bay area features the most diverse arrays of perch species found anywhere on the west coast. For example, during the first Sand Crab Classic held in January 2005, I saw 7 varieties of perch landed off the Santa Cruz Municipal Wharf alone. Joe Gomez of Watsonville won the grandmaster trophy this year with a giant barred perch weighing 2 pounds, 15.5 ounces and measuring 16 inches long. Jay Punkar won first place in the senior barred perch division by catching a fish weighing 2 pounds, 15 ounces and measuring 16 1/2 inches off Big Sur. David Hernandez placed second with a 2 lb. 11.8 oz fish that he caught off Manresa, while Greg Gomez placed third with a 2 lb. 10.3 oz perch measuring 15-1/4 inches that he landed off the East Side. 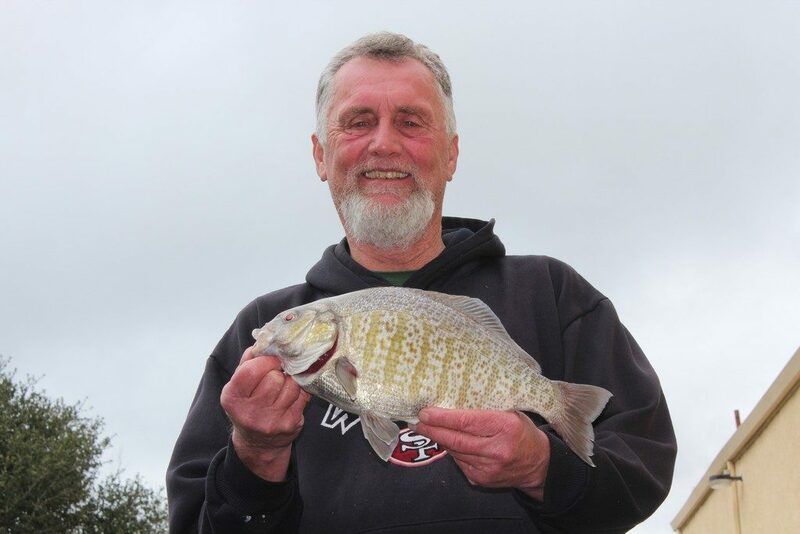 Bryan Servel placed first in the senior non barred perch division by bagging a striped perch weighing 2 pounds, 3.6 ounces and measuring 14 1/8 inches off Monterey. Molly Hanson won first place in the womens barred perch division by bagging a fish weighing 2 pounds, 14.9 ounces and measuring 15 5/8 inches off New Brighton Beach. Corvette Sundberg placed second with a 1 lb. 9.9 oz. perch caught off New Brighton Beach, while Amanda Snodgrass placed third with a 1 lb. 8.3 oz. perch measuring 12 15/16 inches caught off Zuma. Melanie Gilbert placed first in the womens sea perch division with her 1-pound, 7-ounce calico perch measuring 12 1-1/2 inches caught off New Brighton Beach. Kristin Lesyna placed second with her 1 lb. 1.5 oz. redtail perch measuring 12 inches landed off Pescadero in San Mateo County. 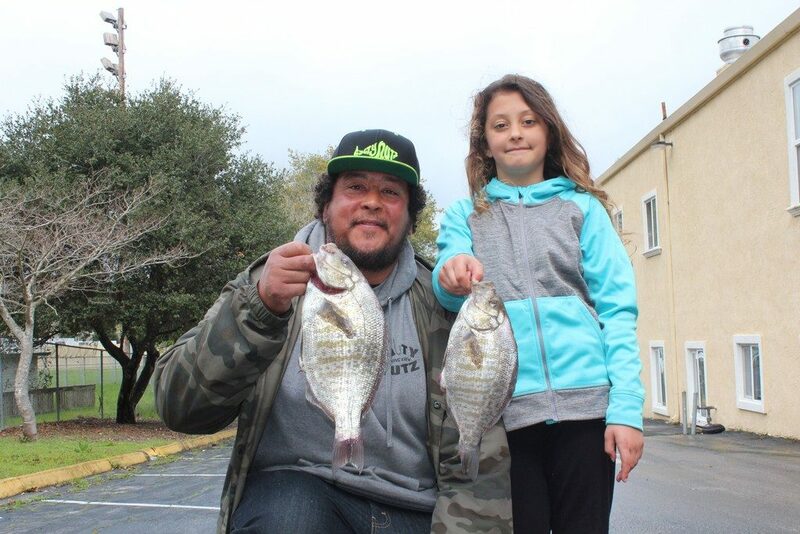 Madison Jaurequi won first in the junior barred perch division with a 2-pound, 7-ounce fish measuring 15 inches landed off Zuma. Reiden Jaquequi placed second with a 2 lb. 5 oz. fish measuring 15 inches caught off Manresa Beach, while Alison Langley placed third with a 1 lb. 13.6 oz. barred perch hooked off New Brighton Beach. Samara Cortazzo won first place in the junior seaperch division with a 2-pound, 5.5 ounce pile perch going 15 ¾ inches. Max Periot placed second with his 15.1 oz. calico perch measuring 11-3/4 inches, while Mila Shake placed third with her 14.3 oz. redtail perch measuring 11 ¾ inches. Finally, Evan Praskin placed first in the fly fishing division with his 15-inch barred perch. Justin Ice placed second with his 13 1/8 inch barred perch caught off San Gregorio, while Richard Gilliam finished third with his 12 3/4 inch barred perch landed off Carmel. The winners all received trophies. As usual, the Sand Crab Classic was a fun grassroots community event featuring many raffle prizes, wonderful food and lots of good times for all. Information: https://www.sandcrabclassic.com/index.php. Clara Ricabal, the field representative for Jackson Fishing Kayaks, targets various species of fish and game from ling cod to salmon to largemouth bass, and was very enthusiastic about the event. “It was windy and rainy, and in spite of numerous casts, I had only one bite, but it was a good one, creating a few moments of excitement. However, I got too excited as the fish put on quite a fight and I was able to get the it close to the surf before I walked forward when I should have backed up. There were around five other fishermen on our beach, and they also seemed to struggle,” she said. “My happiest moment was watching my friend, Bryan Servel, take the first spot in the Sea Perch Division. He has been trying for many years, and despite recent health setbacks, he finally came out on top,” she concluded. I love fishing for perch – and got my start fishing for these light tackle scrappers in Monterey Bay back when I was living and working in San Jose. Felix Alvarez, now living in Modesto, and I often had fun fishing the rocks and piers from Santa Cruz to Moss Landing, with my largest rubberlipped perch, caught in the early 80s, weighing around 4 pounds. It’s always astounded me that so relatively few rubberlipped perch are weighed in the event each year. Season: Monterey Bay and the adjacent ocean coast features some of the most diverse populations of surfperch (Embiotocidae family) found along the Pacific coast. The season is open year round. Sand Crab Classic Information: Mike Baxter or Allen Bushnell, the Let’s Go Fishing Radio Show, ww.theletsgofishingradioshow.com. Call Mike Baxter at (831)685-0900. Most anglers target perch from piers and beaches, but anglers also catch them from boats. Public boat launching is available at Monterey Harbor, the U.S. Coast Guard Pier, Moss Landing and Santa Cruz Harbor. You can get perch tackle and information on fishing conditions in the bay at Bayside Marine, Santa Cruz, (831) 475-2173; Santa Cruz Boat Rentals, (831) 423-1739; Capitola Boat & Bait, (831) 462-2208 and J&D Auto Gone Fishing, Monterey, (831) 899-1111.